Growth Habit: Plantains are common weeds throughout Tasmania. 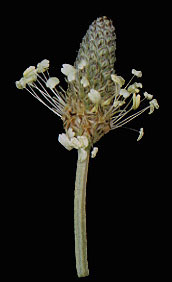 The most common species is Plantago lanceolata. This species develops a leafy rosette up to 30cm wide and high. It has mid to light green leaves that have 3-7 longitudinal veins. Type of Plant: A low growing perennial. Flowers: The flowers grow in tight clusters which are 1 to 2.5cm long. Individual flowers are quite small and insignificant. Fruit/Seed: Seeds are black to brown in colour. Germination occurs autumn to winter. Dispersal: Seeds fall from the seed head and may be carried short distances on wind. Soil and water movement may move them further from the parent plant. Distribution: Plantain can be found in lawns, gardens, most pastures and virtually all roadsides. Plantain may contribute to hayfever. Infestations can become quite dense in run down lawns and pastures, excluding desirable grasses. Some biodynamic farmers promote plantains as a deep-rooted supplement to traditional pasture species as they can access nutrients deeper in the soil than most grasses. Grubbing (all year). Ensure entire plant is removed especially the long taproot. Cultivation (all year). Breaks up plantain clumps. Follow up with establishment of a competitive pasture or crop. Herbicide (spring, summer and autumn). Herbicides registered in Tasmania include dicamba, MCPA, glyphosate, 2,4-DB and 2,4-D.